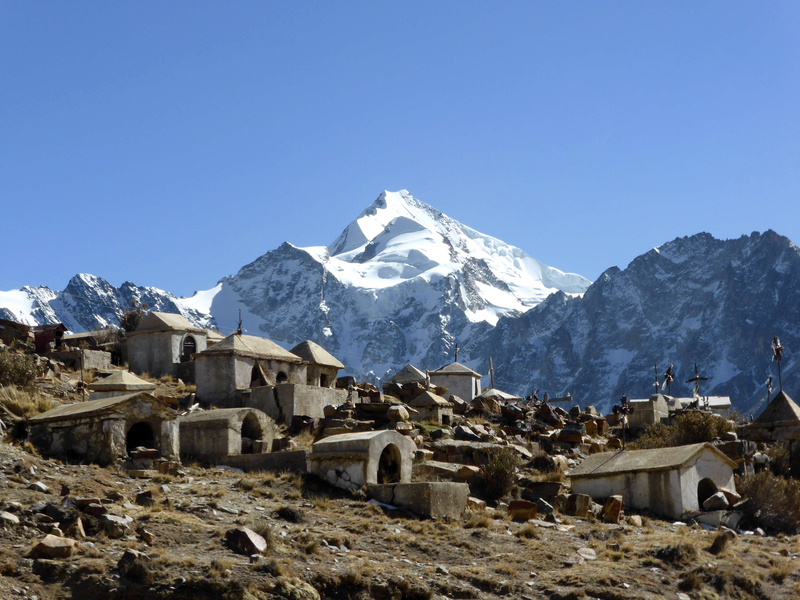 Huayna Potosi, from a graveyard near the Zongo Pass. 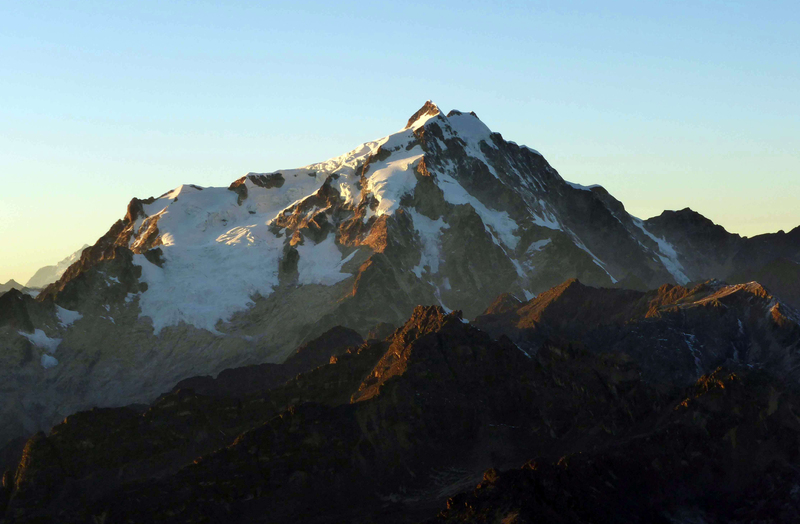 6088m Huayna Potosi is indisputedly Bolivia’s most popular climb, largely due to very easy access from nearby La Paz. 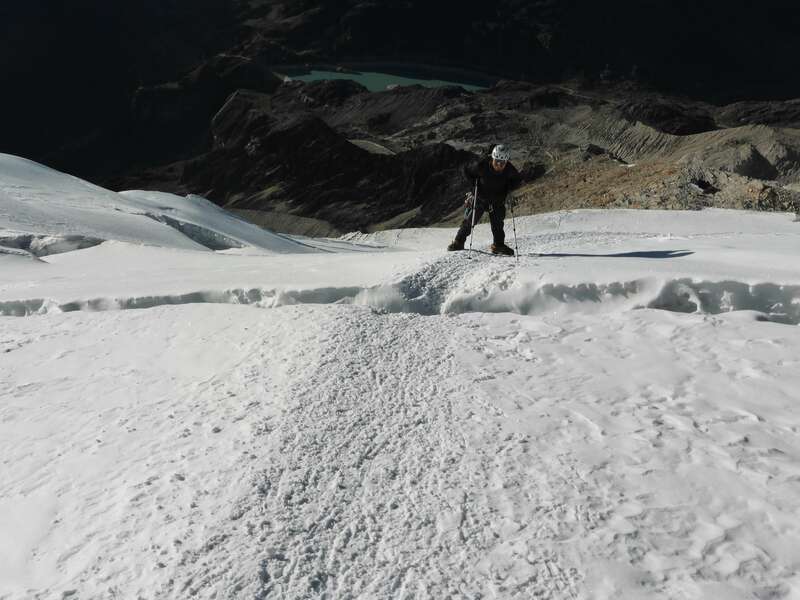 Referred to by some as the world’s ‘easiest’ 6000m peak, Huayna Potosi presents a straightforward glacier climb made worthwhile by two short yet interesting technical obstacles and excellent views from the summit. Huayna Potosi from the northwest, on the approach to Pequeno Alpamayo. While climbing and camping in Bolivia’s Condoriri group of mountains I met Pedro, a mountain guide and the nephew of my 1:1 guide in the Cordillera Real. The two of us hit it off, and together we made a plan for a lightweight attempt on Huayna Potosi. 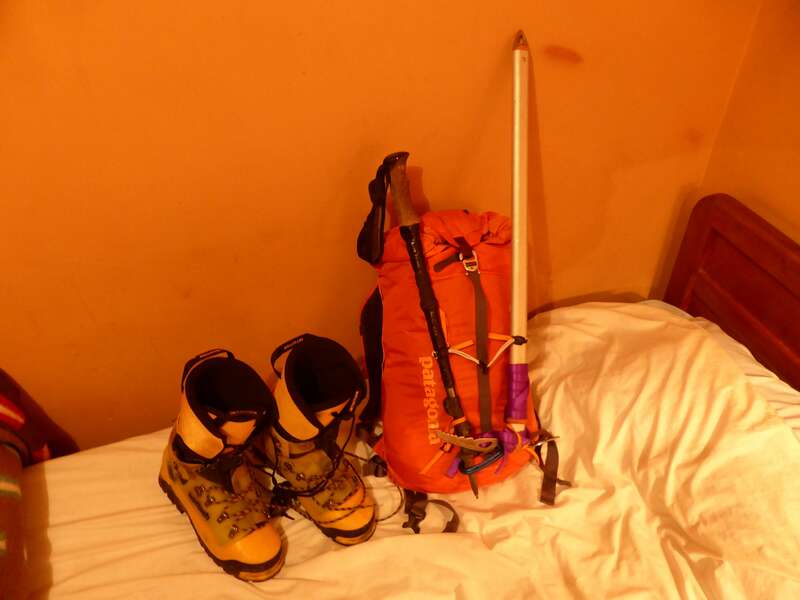 Packing minimal glacier gear, some water and basic snack food, we intended to climb the mountain in a single push overnight. 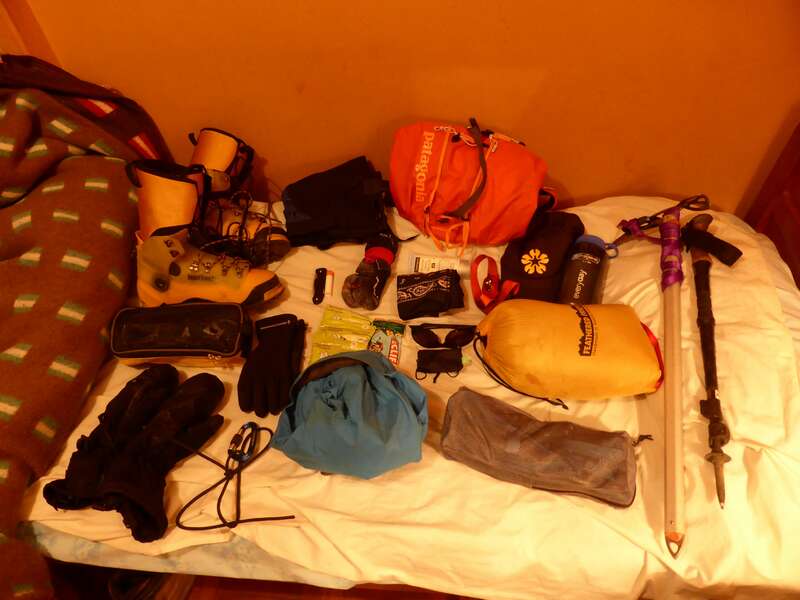 My equipment and supplies for the climb. Pedro and I left La Paz by car at 7 p.m. and arrived at the 4700m Zongo Pass trailhead a few hours later. We caught a few hours of sleep in the nearby basecamp hostel, where Pedro had friends and access to mattresses for us. Awake at midnight, we quickly drank some tea and started moving, wearing hiking boots and carrying our climbing boots over the shoulder. From the basecamp a short hike of around one hour took us over moraine and rocky slopes to the high camp refuge, where most climbers spend a night before beginning their summit push. At this point we were both overheated and sweating from nearly jogging the approach hike, and so stopped inside the refuge to dry off, hydrate, and change into plastic boots. As we rested in the refuge several large groups of climbers were finishing their own preparations and leaving in waves to begin climbing towards the summit. Pedro and I waited for the last of them to leave and started out from the refuge at around 2 a.m. Looking down the lower glacier. The high camp refuge is center right, and the rocky approach hike stretches out to the road. Quickly making the edge of the glacier, the climb started off straightforward and only moderately sloped. Tens of headlights shone off the snow and ice, illuminating the darkness ahead. These belonged to lines of roped climbers, big guided teams who had set out from the refuge before us. With no fear of hidden crevasses on the well-travelled route Pedro and I moved unroped and fast. Shortly we found ourselves climbing alone into the darkness, the lights of the others stretched out below. We soon reached the first semi-technical obstacle of the climb, a bergschrund crossing involving a ~5m chute of 70-80 degree ice. Using my general-purpose ax’s pick for leverage I took five or six moves to scale the wall. The bergschrund presented only a short break to the otherwise simple climbing, but the fast moves up steep ice and our rapid pace made for a feeling of excitement. 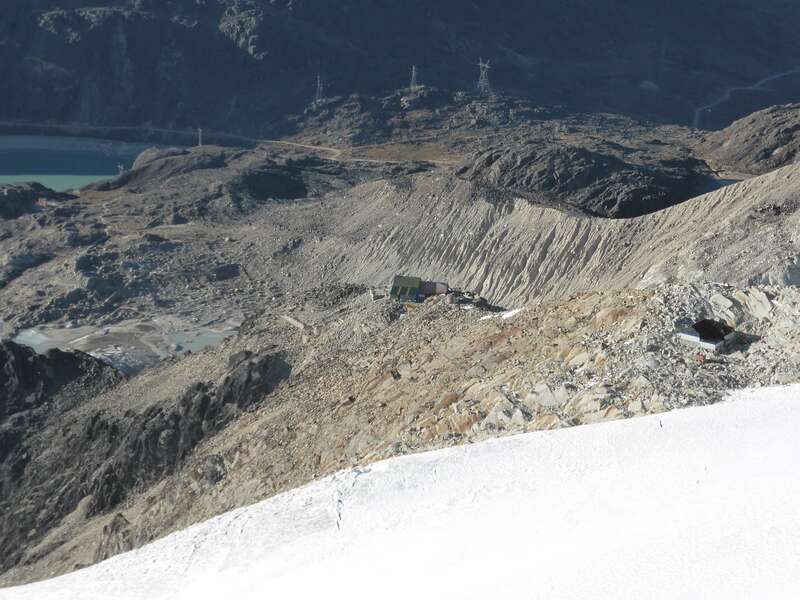 Following the glacier straight upwards and across slightly steeper terrain, to a maximum of around 45 degrees, we soon reached the base of the summit ridge and final section of climbing leading directly to the top. We were too early for the sun’s warmth, and the freezing winds on the exposed ridge above held us off. Pedro and I waited below the ridge for around twenty five minutes, and only as the sun began to rise on the horizon did we move onwards. The summit ridge was very narrow and exposed to sheer drop-offs. While not particularly steep, the level of exposure and delicate footing required complete focus. We moved across the ridge carefully and soon found ourselves at the top, a sharp and corniced point with nowhere higher to climb. It had been four hours since we left the high camp refuge. While we were the first ones on the summit we didn’t have it to ourselves for long, and a large group of ~10 climbers quickly arrived after us. We decided to move off of the summit proper, nervous of the number of people now standing on the corniced overhang, and stood on the ridgeline just below taking photographs and admiring the incredible views. 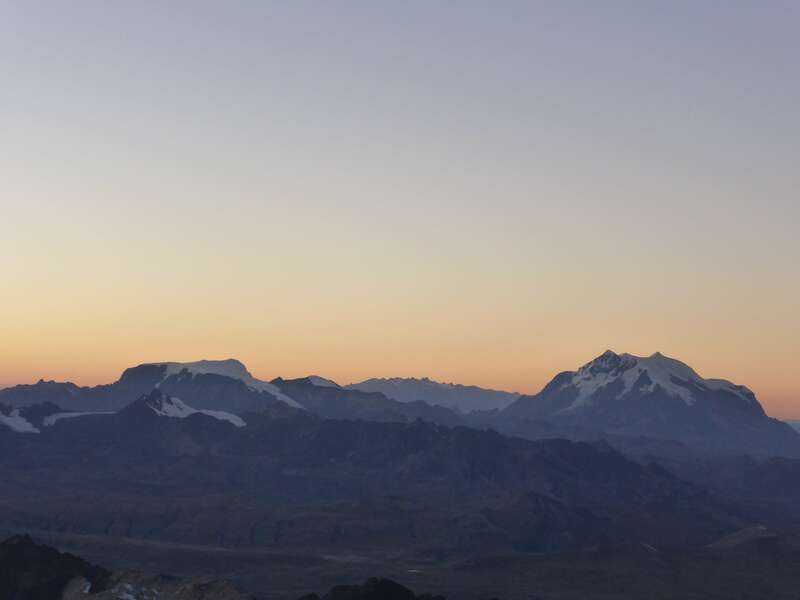 Illimani and Mururata were clearly visible on the skyline, as were the lights of nearby La Paz. The sunrise cast a glow over the mountain, and with it brought welcome warmth. As the summit grew more and more crowded, we decided to begin descending. 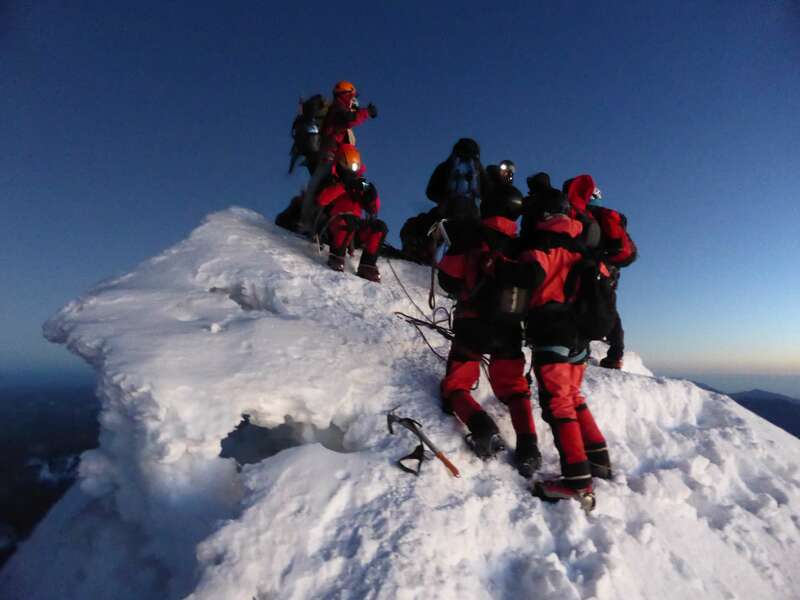 The corniced summit of Huayna Potosi and a large group of climbers. 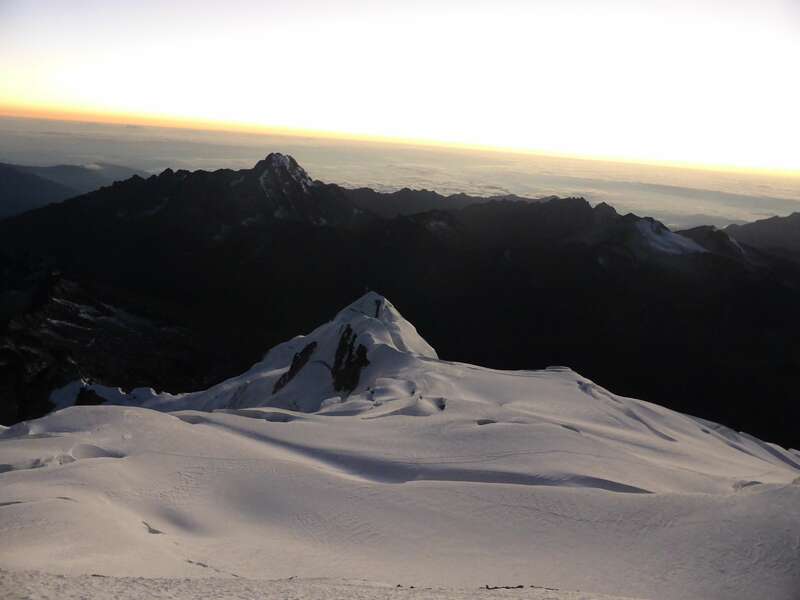 Looking across the ridge just below the summit, Mururata and Illimani on the horizon. Sunrise begins over the glacier. Sunrise over the cloud ocean far below. 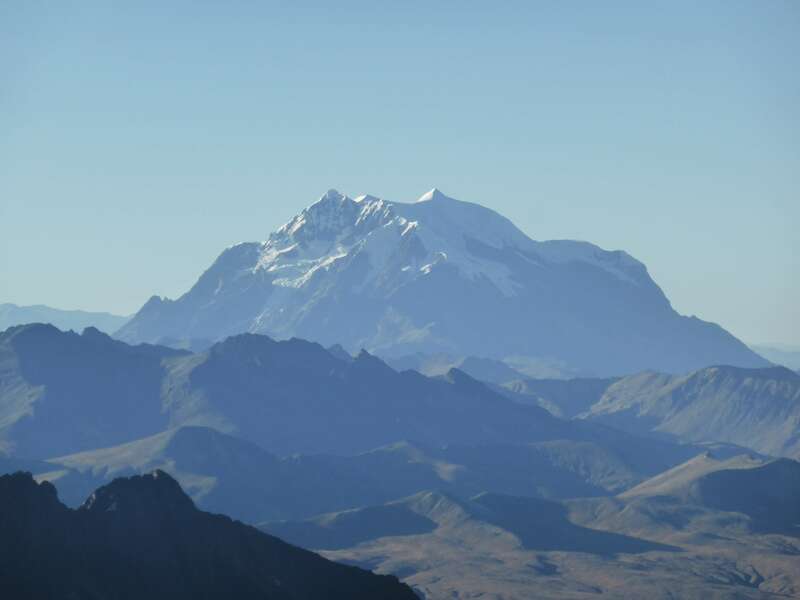 Illimani from near the summit of Huayna Potosi. We put our rope to use during the first section of descent immediately below the summit, a steep downclimb of the face below the summit ridge. Once off of this steep section we unclipped and continued descending at a brisker pace. 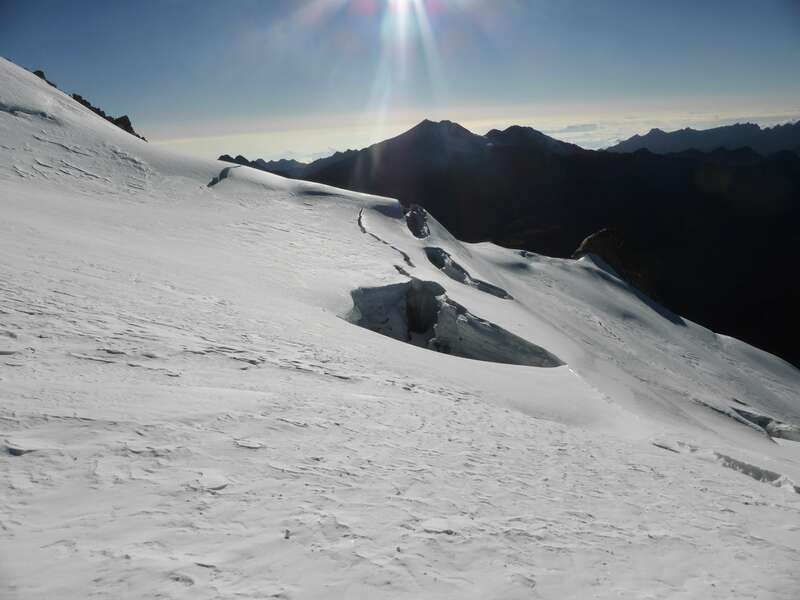 In sunlight the size and beauty of Huayna Potosi’s glacier became apparent. Looking back at the upper glacier. We crossed several deep crevasses by jumping them. Our descent took us across several open crevasses. Arriving back at the high camp refuge in good time we stopped to take a rest and drink some water. After switching back into trekking boots and packing up our axes and cold weather gear we took our time during the hike out to Zongo Pass and the car, enjoying the sunshine and views of the mountain behind us. Looking back at Huayna Potosi. On the drive back to La Paz we stopped by a nearby lake to take one last look at the mountain. It was very satisfying to admire Huayna Potosi’s aesthetics knowing that we had stood upon its summit just hours earlier. Huayna Potosi, from the road to La Paz near Zongo Pass. 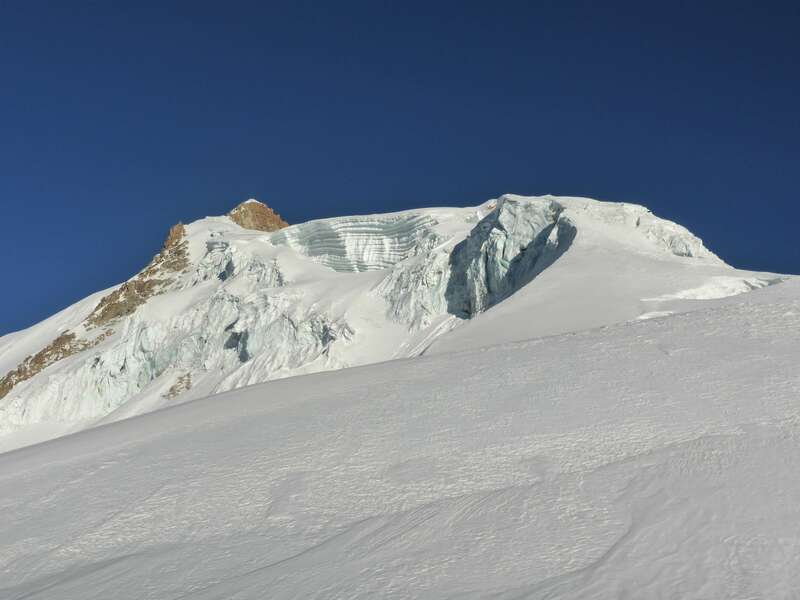 Huayna Potosi was an enjoyable and very fun climb, largely due to our approach of tackling it in a single fast and light overnight push. Climbing a 6000m peak overnight was exciting, and the exposure of the summit ridge made for an interesting finish. 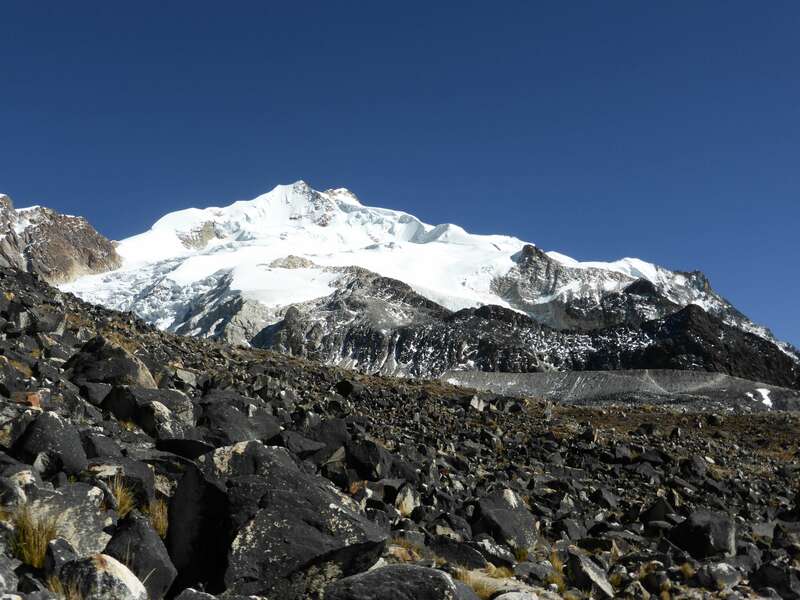 Huayna Potosi is the most popular climb in Bolivia and transport, logistics, and guiding services are easy to find in La Paz. Zongo Pass can also apparently be accessed by public bus. There are no permit or access fees. 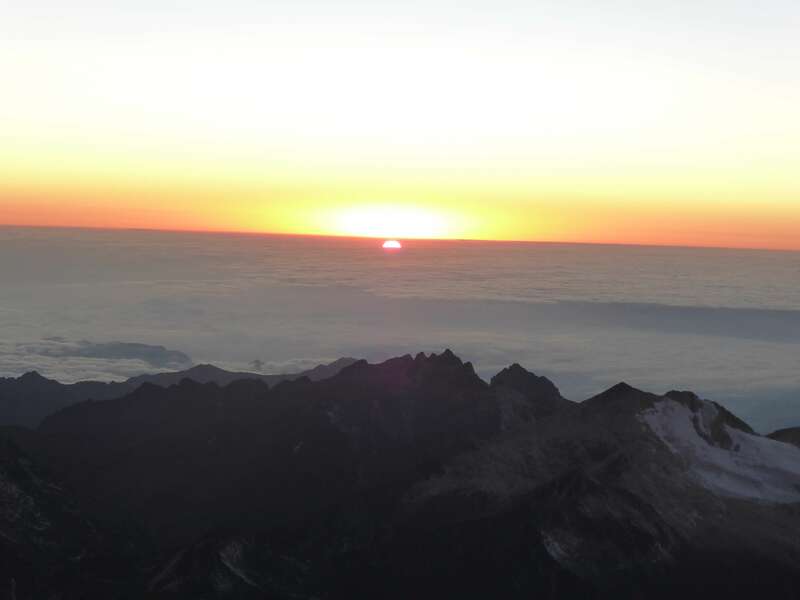 At just over 6000m, Huayna Potosi is a high altitude climb. Acclimatization is important. 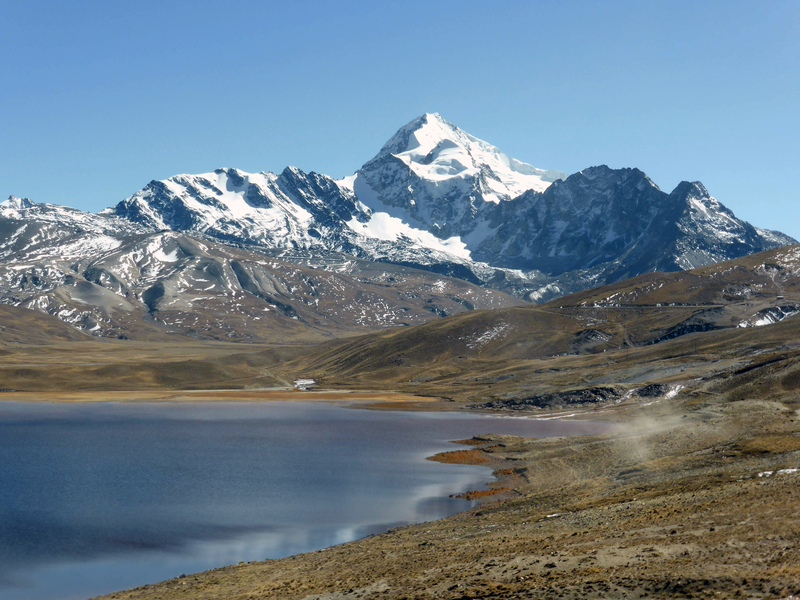 I acclimatized by hiking and climbing in the nearby Condoriri group of mountains. For logistics and a 1:1 guide I used the services of Eduardo Mamani and his company http://www.bolivianmountainguides.com/. During my trip I climbed with Eduardo himself, as well as with his brother Gregorio and their nephew Pedro. All three are certified UIAGM / IFMGA guides, are exceptionally strong, professional, and personable. When I return to Bolivia I will, without doubt, contact Eduardo again. 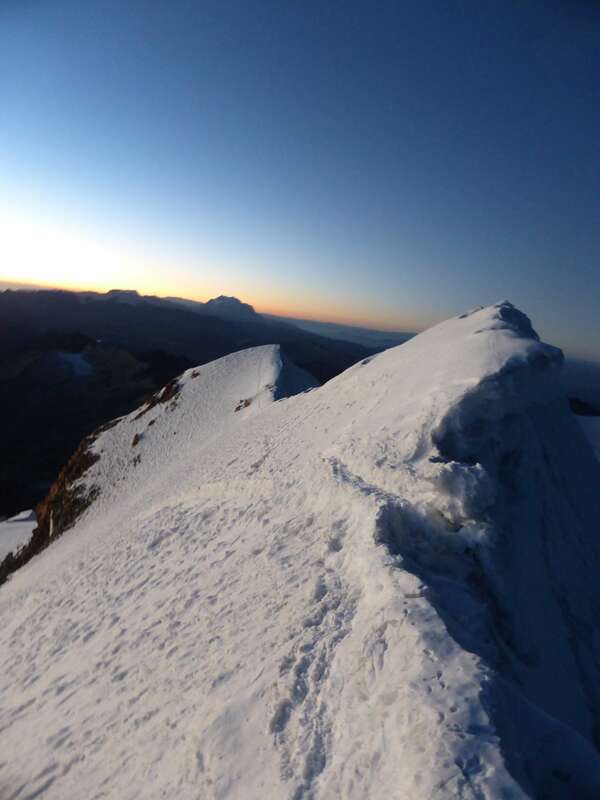 This entry was posted in Bolivia, Mountaineering and tagged Huayna Potosi, Illimani, Mururata, Zongo Pass by Ian. Bookmark the permalink.